Michigan is a Midwestern state in north central United States in the Great Lakes region. There are many famous Native American tribes who played a part in the history of the state and whose tribal territories and homelands are located in the present day state of Michigan. 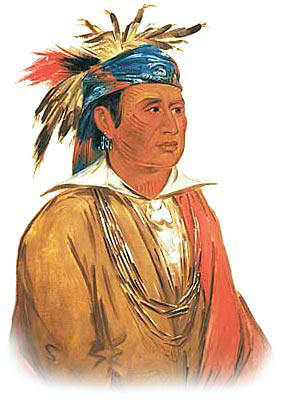 The names of the Michigan tribes included the Huron, Menominee, Chippewa, Potawatomi, Kickapoo, Miami (see above picture), Noquet, Ottawa and Fox tribes. The climate, land, history, environment and natural resources that were available to the indigenous Indian tribes in Michigan resulted in the adoption of the Northeast Woodlands culture. 1763: 1763-1675 -- Pontiac's Rebellion, Chief Pontiac's tries to force British out of the West, Michigan, New York and Pennsylvania. The history of the European invasion brought epidemic diseases such as tuberculosis, cholera, influenza, measles and smallpox. The Native Indians of Michigan had not developed immunities against these diseases resulting in huge losses in population. Exploitation including the leverage of taxes, enforced labor and enslavement were part of their history, taking their toll on the Michigan Indians.